Last month I posted a picture of a hummingbird in flight taken with my old camera. Even though I used a fast shutter speed—1/1600th of a second—the bird’s wings were blurred. 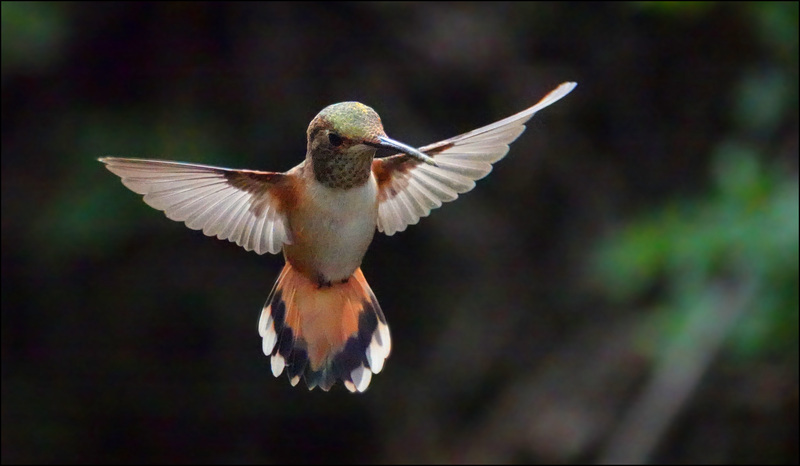 This led to a comment from our resident bird guru, Steve Schafer: “The wingbeat frequency of a hovering Allen’s Hummingbird is about 60 Hz, although it’s less than that when it’s lifting off, so with a shutter speed of 1/1600, you’re seeing around 1/30 of a full beat, which looks about right. You’d need at least a factor of 10 shorter (e.g., low ambient light with a high-speed flash) to freeze the wing.” Hmmph. Then karma struck. Last Friday I noticed that our honeybees were back, so I decided to crank up the new camera to 1/32000th of a second and see if that would freeze a honeybee’s wings. But I got lucky: While I was taking pictures of the bees, a hummingbird flew over and hovered in the same spot for a several seconds. Then I got lucky again: the camera was already set for high-speed critters, so I aimed it at the hummingbird and got it dead center. The autofocus did its job and the high-quality lens did its job. I got a burst of good shots of the hummingbird. As it happens, the sky had gotten cloudy and I had given up on 1/32000th of a second. I had switched to 1/16000th, precisely what Steve had suggested. And sure enough, the wings were frozen. I never thought I’d get a picture like this, but modern technology made it possible. As recently as a few years ago, no camera I had ever owned had a high enough shutter speed or a quick enough autofocus or a fast enough burst mode. It would have been literally impossible to freeze a hummingbird in midair without specialized equipment. Now I can do it with a midrange, off-the-shelf consumer camera. In fact, not only can I do it, I can do it pretty easily. It’s amazing. 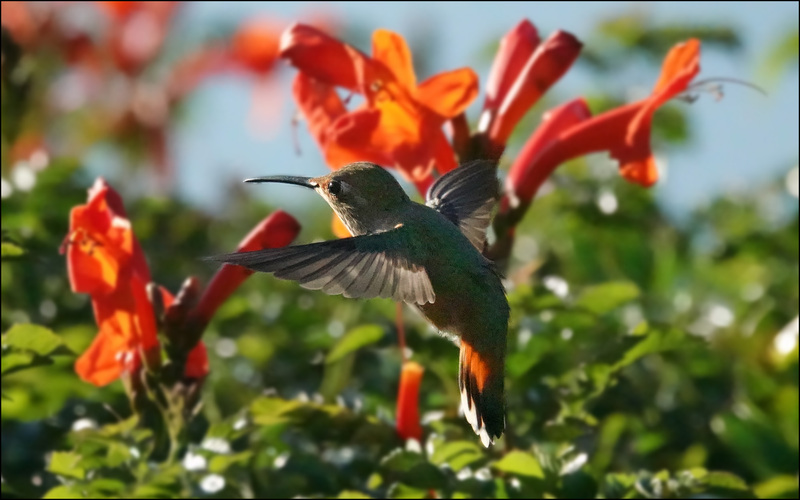 Here’s another hummingbird from Sunday. Nice picture, too bad about the busy background. 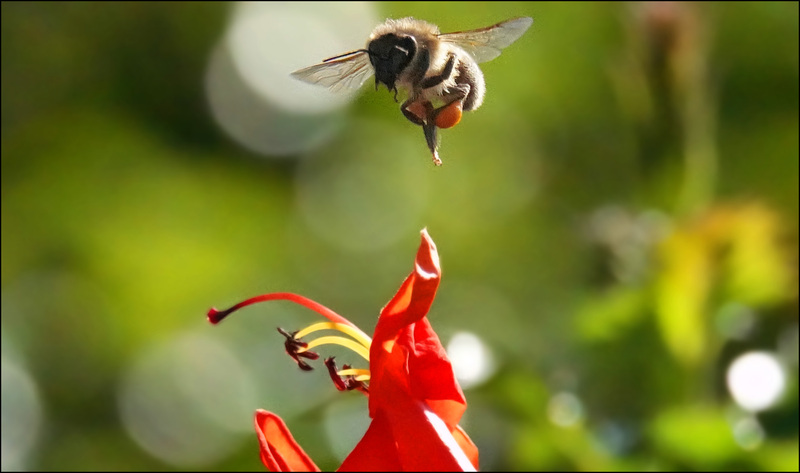 And here’s a honeybee. A shutter speed of 1/16000th was fast enough to freeze its wings too.